We are dedicated to preventing disease and treating illness, educating and inspiring future leaders in the field of internal medicine, and supporting innovative biomedical research. We aim to provide compassionate patient care of the highest quality, and translate new knowledge into meaningful improvements in healthcare outcomes. We believe these goals are best met through interdisciplinary collaboration, fiscal responsibility, support of diversity, a focus on quality, and a culture of professionalism dedicated to teamwork and collegial relations. With these values as our foundation, the Department of Medicine is committed to promoting the best interests of the University of Virginia and the community we serve. We strive for a sense of community, connection and synergy among all faculty, staff and trainees. a culture that encourages lifelong learning, mentoring and advocacy. We will conform to the highest ethical standards, uphold the values of our partner organizations, and give back to our community through public service. 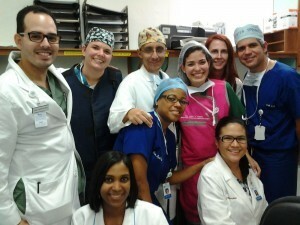 Above: UVA physicians and colleagues from CEDIMAT Medical Center in the Dominican Republic (DR). DOM’s Cardiovascular Fellowship program has an ongoing humanitarian initiative that provides free treatment for mitral valve stenosis to hundreds of people a year in the DR who would otherwise not receive medical attention. 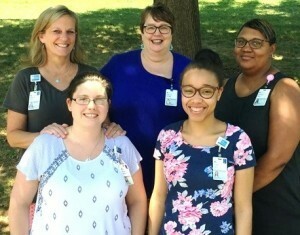 “Going the Extra Mile to Help a Patient in Need“: Ryan White HIV clinic staff members (clockwise from top left) Kathryn Dort, FNP; Pam Bickley; Veronica Ross; Tracy Ivery; Morgan Blevins. 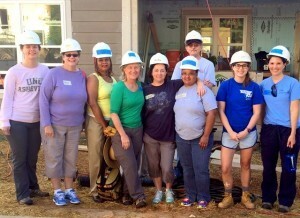 Department of Medicine volunteer team at a Habitat for Humanity work site in Charlottesville.